At the 105th Annual Session of PHD Chamber, Mr. N. K Chaudhary, CMD, Jaipur Rugs Company Private Limited (JRCPL) received ‘Distinguished Entrepreneurship Award’ by Mr. Pranab Mukherjee, Hon’ble Finance Minister. The PHD Chamber Annual awards for Excellence were instituted by PHD Chamber of Commerce and Industry, to bestow recognition to the Indian businesses, entrepreneurs, and individuals for outstanding achievements and their contribution. 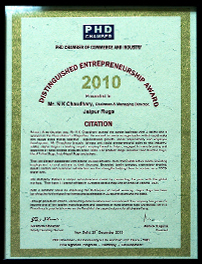 Since then, theme based award constituted. The theme for 105th Annual Session was “Inclusive Growth thru Skill Development – Vision 2017”. Finance Minister Mr. Pranab Muukherjee said that “The theme of the meeting is dear to my heart and core to our economic development and social transformation”. The goals shared were common for all, where growth would not be sustainable without skill development, which is also evident at JRCPL. Mr. N. K. Chaudhary has always believed in the innate powers and has constantly worked to empower the rural artisans through training and education programs.